In Part I the data showed that, after the hurricanes, anole lizards had on average larger bodies, shorter legs, and larger toe pads. The patterns were clear and consistent across the two islands, indicating that these traits are adaptations shaped by natural selection from hurricanes. At this point, however, Colin was still not convinced because he was unable to directly observe the lizards during the hurricane. Colin was unable to stay on Pine Cay and Water Cay during the hurricanes and directly observe the lizards. To be more confident in his explanation, Colin needed to find out how lizards behave in hurricane-force winds. He thought there were two options for what they might do. First, he thought they might get down from the branch and hide in tree roots and cracks. Alternatively, they might hold onto branches and ride out the storm. If they tried to hold on in high winds, it would make sense that traits like the length of their limbs or the size of their toepads would be important for their survival. However, if they hid in roots or cracks, these traits might not be adaptations after all. To see how the lizards behaved, Colin needed to design a safe experiment that would simulate hurricane-force winds. He bought the strongest leaf blower he could find, set it up in his hotel room on Pine Cay, and videotaped 40 lizards as they were hit with high winds. 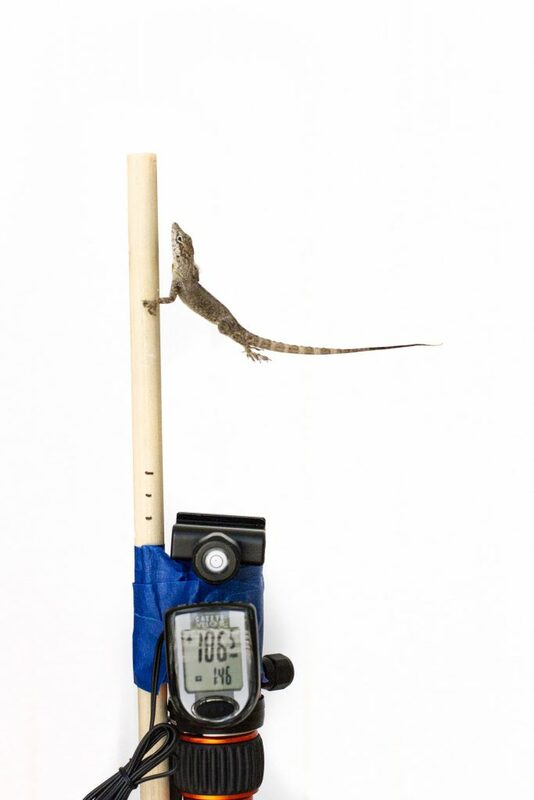 Colin first set up this experiment to observe behavior, but he ended up learning not only that, but a lot about how the traits of the lizards interacted with high winds. To begin the experiment, Colin placed the anoles on a perch. He slowly ramped up the wind speed on the leaf blower until the lizards climbed down or they were blown, unharmed, into a safety net. He recorded videos of each trial and took pictures. To engage students in this activity, show the following video in class. This video gives some information on the experiment and Colin’s research.